In my first post on this subject, I promised I'd document the makeover of the annexed room once it was done. Today the Murphy bed was delivered. And I installed the new halogen light fixture (wow, that is bright!). So it's sufficiently done to show you. The two Expedit units I put together a few weeks ago are shown here. It didn't take very long before they were both pretty full. I rolled my knit stash into two cubes of the shorter unit. Previously, this part of my stash was in under-bed storage and so practically inaccessible. Reacquainting myself with it was a good thing - I've already used part of one piece! On the opposite wall is the pièce de résistance - the newly-installed Murphy bed. It looks like a nice big closet, but folds down to be a full-sized bed! It's very easy to operate - special hardware ensures it is practically effortless to raise and lower. It even has a built-in reading light! I love the fact that this bed means the room is completely dual-purpose. 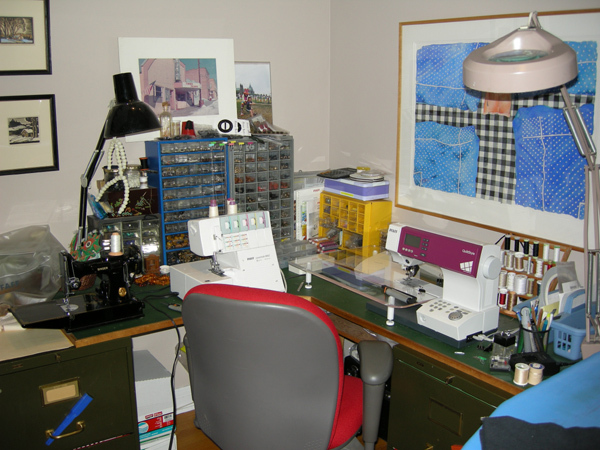 It's a very comfortable bedroom, but it leaves tons of space for my cutting table, when the bed is folded up! Finally! I can walk all the way around my cutting table. Bra bridges, that is. Both Beverley Johnson and Norma Loehr recommend starting with the bridge. So of course I followed their instructions, sort of. In fact I did dutifully make the cardboard bridge they both talk about, but then I kind of did my own thing with my fitting bra which involved starting with the bridge pattern from my pink bra that doesn't really fit properly (top), narrowing it at the top for better fit and lengthening it (I forget why - middle), and finally accepting reality and also widening the base of the bridge substantially for better fit (bottom). Guess what? The last bridge is extremely close to my cardboard version. Since swapping out these bridges involves unpicking the channel for the wires and the stitching that attaches the bridge to the cups, and taking out the line of stitches above the channeling at the CF that prevents the wires from poking out in the wrong place, and reinserting the wires, making the new bridge, sewing it in, re-sewing the channels, and trying the whole thing on again (times three), it would have been quite a bit faster to just follow the learned authors' instructions. So here is my fitting bra. It's single layer, made out of some lycra fabric I have a lot of, and basted together in pretty rudimentary fashion. It fits me a lot better than my DTD, but this is all I'm willing to show the world. In the next picture, I've highlighted some of the haute couture construction information, but also the problems that also appear when I put this beauty on. I've not highlighted the problems, such as the rippling cup seam, that disappear when it's me wearing it. Should I be worried about the fact that there is a flattish area of the lower cup near the bridge, below the pink dotted lines? It is less pronounced on me than on the DTD, which is why I'm even asking this question instead of being sure that the answer is to change something to fix this. My logic for doing nothing is that angling the lower bridge so it is even wider will just push the wires up into my under arm area. Further, the bra looks good and on a try on it feels pretty comfortable. The wires are sitting nicely where they are supposed to. Should I be worried about the vertical wrinkles below where the strap attaches? There is no elastic at the arm edge of the cup, and my thinking is that if that was stabilized and snugged in somewhat, these wrinkles may go away. If I was going to fix this, what should I do? I am already very grateful for the advice in the comments on my last post! 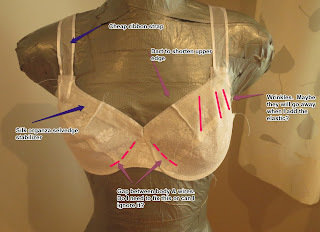 I have taken Liana's advice and for now I'm working on a mashup of my pink bra (which was already a mashup of an ancient Burda WOF (as it then was) swimsuit pattern and a PinUp Girls bra pattern...). So weigh in and give me your best ideas and advice! I have Beverley Johnson's Bra Makers Manual. I have this pattern from Merckwaerdigh. 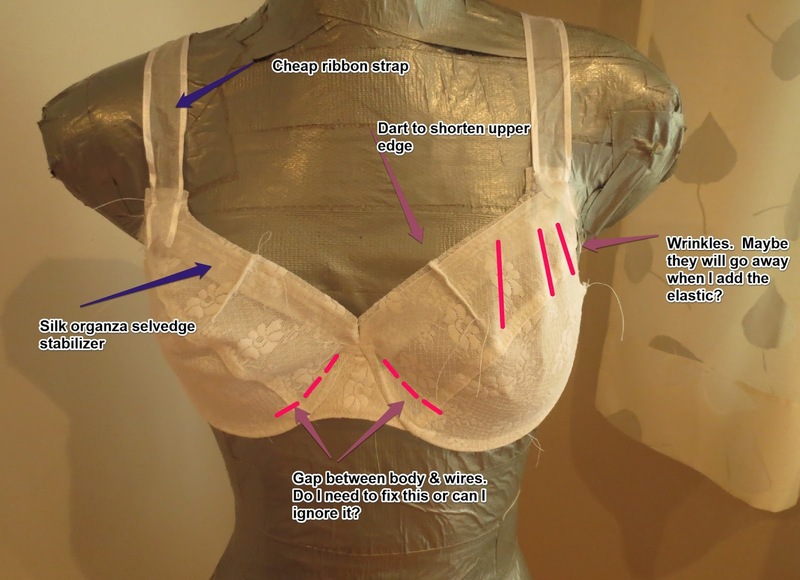 I have Demystifying Bra Fitting and Construction by Norma Loehr (of Orange Lingerie) on my iPad. I have some mixed experience at making things that look like bras. There is this one which, truth be told, is too big and has wires that dig in at CF. And this pink one, which is tantalizingly close if only I pin 2cm out of the length of the upper cup. I have lots of lycra fabric and elastic. I think one of my New Years resolutions was to make a proper bra that actually fits. I am ready to go. What do you mean, it's almost September? It's still 2013. 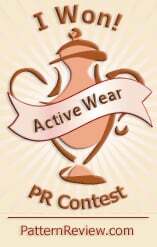 My first outing, the so-called "sports bra" from the Merckwaerdigh pattern, was a bust (pun intended). A bust nothing like mine. As you can see. I kind of like the back, but this is really the wrong size (and shape) for me. This one will not ever be finished. For my next effort, I have pinned out 2cm approximately from the upper cup of the pattern I used for my pink effort. At the same time, I've traced a smaller size from the Merckwaerdigh pattern. This scattergun approach may come to grief. Time will tell. Neither of these is getting lining or elastic edging. I wasted some good FOE on that Merckwaerdigh bra. I'm making fitting muslins per the Orange book. I hope the title for my last post wasn't too critical. I really do like the Pavlova top. Here's the proof. I made it again. However, first I fixed the couple of things that bugged me about the pattern. First the sleeve. I made it an inch longer. This is simple. Slice through the sleeve, parallel to the hem edge. Add the desired length by sliding the cut-off part out evenly. Add tissue. More complex was the fix for the too-long upper edge of the wrap front and tie. First I tried on my earlier version, and pinned out what seemed right. I measured this. Five inches along the top edge. That seemed like a lot, but it also seemed about right. Here is how I took that length out of the pattern piece. In the photo at left, you can see the tie end. The angled line to the right is the seam line where it attaches to the front. The dark green lines are seamlines and the orange lines mark a wedge which measures five inches along the top edge. I folded out the wedge by aligning the orange lines. I left the original length of the seam which will attach to the top. Five inches looked like a terrible awful lot to fold out. So I chickened out and backed it off by a bit more than one inch, as you can see at right. Then I added some tissue to create a curve from the original end of the piece. Then I threw caution to the wind and cut out my second version of this top. I used another gigantic rayon/lycra print. Here's a view of it, with my feet for scale. I had little choice how to cut it out. I have one big green area on my back and none on the front. It's disappointingly uniform looking. Using these massive prints effectively is an art. An art which The Sewing Lawyer may or may not have mastered. The ties on this version are longer than on my other version. When I shortened up the top edge, I got nervous (unnecessarily) that somehow the ties would be too short to wrap around and connect. Silly! They would have been the same length. However, I went up to the next size, and these are just fine too. What about the wedge alteration? Well, it is not something I notice when I put the top on. But that's a good thing. I definitely noticed the too long top edge, that I had to fiddle with. This is much better. And I could have taken out the full five inches without any problem whatsoever. One more thing: the instructions for sewing the collar are a bit weird. They produce an OK result. But the diagrams are somehow off. Here's how I put this version together. Here is the inside of the front showing the markings (and where I have used a light fusible to stabilize the darts and corner). And here are the pieces from the right side. The collar is the rectangle at top. Your goal is to sew it into the opening below, with the lower corners where the seam allowances on the collar piece cross attaching exactly at the point into which you have clipped (as marked on the pattern). I sewed the ends first, just to that pesky inner corner point. I pressed the seams open. Then I sewed the seam at the base of the collar. Because I interfaced the collar piece (with a slightly stretchy knit fusible this time) the body shoulder seam easily stretched longer than the collar piece. Do not be fooled. they are the same length. If necessary (i.e. if you get little puckers in the body) unpick and re-do. I had to do this twice to get rid of little pleats/tucks. The pattern instructs you to fold the lower edge and edge-stitch it to the body neck seam from the outside. I did this the first time but think the result is cleaner and less bulky this way. And it's easier to maintain a smooth line on the body if you are sewing a regular seam. IMHO. Here's the completed corner from the outside. Nice, huh? The top half of the collar is actually the collar facing. After it was folded down I stitched the two layers together by stitching in the ditch from corner to corner. I may take a break from this pattern now but I will definitely be making a red wool jersey version. For that fabric, I will add some width as well as length to the sleeves. The Sewing Lawyer hasn't purchased many patterns from the new* independent pattern companies that have flourished on the internet in the past few years. There are several reasons for this. One is that there are So. Many. Patterns. already in her collection, waiting to be made. Another is cost (a minor quibble). The third and most significant reason is doubt - that the patterns are good quality, reliable, and will produce the stylish outcome promised by the blogs and websites. This doubt was fuelled by an unfortunate experience with one of the first of these independent pattern producers. The Sewing Lawyer forked out $20(US) per pattern for two designs that looked so great, so wearable, so fashion-forward (dreaded phrase), so "just like RTW". And then found an (obvious) printing error on the pattern tissue, and spent far too many hours sewing a muslin that could not be made to look anything like the so-called technical drawings on the pattern envelope and fit badly, to boot, before spending far too many additional hours cloning the look of these drawings through much laborious work. (If you want to read more and you are a paid-up member of Pattern Review, you can do so here.) This experience led to a decision not to throw any more time away on the second expensive pattern (also satisfactorily cloned - read about it here). It also led The Sewing Lawyer to be convinced that when an individual woman designs patterns for mass distribution, she could be mentally designing for herself (her body type and size), and grading more-or-less successfully for people who are not her body type and size, and that if one is not like her, one should perhaps beware. Now, Stephanie the Consulting Dressmaker who started Cake Patterns ("sewable, wearable basics for busy women - always with pockets!") is a designer whose body type and size are not like mine, but a variety of sewers had made her first dress pattern and everyone seemed to love it. Some of them were shaped like me, so I bought the pattern. (I have yet to tackle making it, but promise to do so ... sometime.) The pattern that really got me interested, however, was her second offering, #0169, aka "Pavlova". It's a pattern for a wrap top and skirt, and it was the wrap top that captivated me. I liked the uncomplicated shape, the high and reportedly 100% secure wrap neck, and the intriguing idea of a waist-length front with a longer back that you could tuck in to avoid gaposis. The skirt, meh. It's a full circle, and therefore a fabric hog. Too much for The Sewing Lawyer (as previously reported). To make a long story short, I cut the top out of some (cheap and cheerful) rayon/lycra print jersey that was rediscovered in the recent excavation of the sewing room. With my white linen skirt, it looks frighteningly like the pattern envelope, don't you think? So ... how does this pattern stack up? First the good. The pattern produces a garment that looks just like the pattern illustration. It is very comfortable and as promised, the front wrap is very secure, and the back "tail" stayed tucked in. I love the way it fits over my shoulders. The top has cut-on sleeves, but it fits neatly under the arm - no sloppiness there. I will make this again (I have some red wool jersey in mind). But, it's not totally perfect. On the technical side, there are a couple of glitches on the pattern tissue. 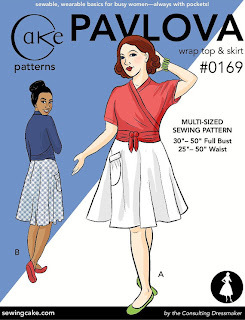 When I looked at the skirt pattern, I realized after flat pattern measuring that the waist would be far too loose; you'd have to gather it into the waistband to get the intended fit at your natural waist. It is acknowledged somewhere on the Cake website that extra seam allowances were added to the pieces (4 seams x 1/2" = 2" too big). Re the top, I found it odd that the darts (at shoulder) were marked only with dots (see photo at left, I pencilled in the dart). Then there are those numbers in blue circles, the significance of which is not obvious. One of four of the instruction pages seems to correspond as it has a large diagram labelled with these same circled numbers, but it's not explained in words anywhere (that I could find) what this is actually for. I ignored it. I'd prefer more conventional markings on the tissue and fewer unconventional ones. The size I used (30 for full bust measurement of 30-34" or 76-86cm) is printed separately on the pattern tissue and for some reason (that I think is a mistake) the lengthen/shorten line on the front piece is not in the same place or (more importantly) at the same angle as the same line on the other sizes (35, 40 and 45) which are nested together. The separate tie piece is printed in many more sizes than the body piece. 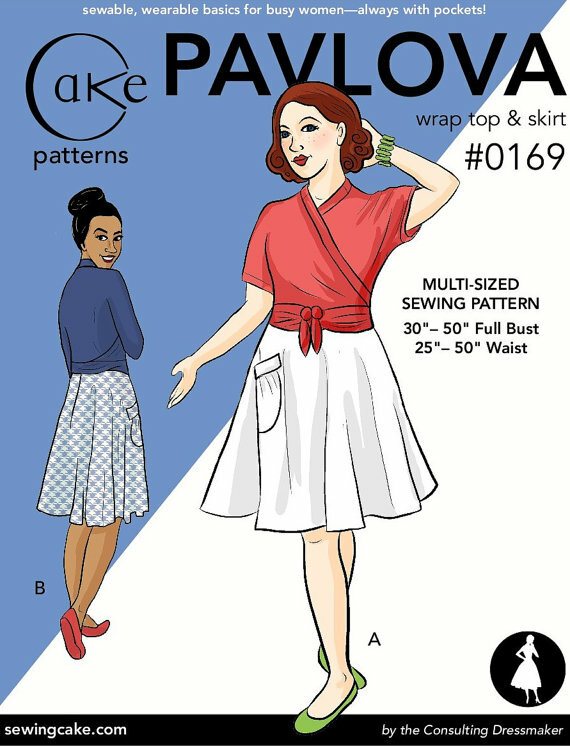 The numbers correspond to the waist sizes (11 of them, starting at 25" and going up to 50") but there is no explanation of the use of the waist measurement in choosing a size for the top anywhere I could find on the pattern itself or in the instructions. I cut size 30 which is bigger than my waist, and the ties are a good length. I think they would have been too short if I had paid any attention to the other numbers. The main pattern piece (the front, back and sleeves are a single piece) and construction of this top are sufficiently off-beat that I paid particular attention to the rest of the instructions, and the top came together without incident. I even bought and used Steam-A-Seam (lite) tape, which made cover-stitching the very long edges of the ties and back hem a snap. Stephanie sings the praises of this product on her website, and recommends the use of "fusible webbing" right in the pattern instructions. Things I did that were not instructed were to interface the shoulder dart area, the collar piece, and the facing/front wrap edge with a very light fusible. I did this to stabilize the lightweight and very stretch fabric I used. I won't need to do this when I make the top from a more stable knit, but I'm glad I did for this version. The side front seam is designed to be a lot shorter than the side back seam, which extends to the tuck-in tail. The front and back part company well above the level of the natural waist, as you can see at right. This is intentional. It allows the left front/tie to sneak out from underneath and wrap around the back (most wrap and tie tops rely on an opening in the right side seam but this one doesn't need that). I was worried that this configuration could lead to exposed skin, but it doesn't. I'm glad I didn't try to lengthen the front piece. Putting the top on is a little tricky. In the main this is because of the angle of the ties. As you can see, they are a continuation of the front and point distinctly downward. However, to wear this top the ties have to be wrapped horizontally around the body. When their orientation is changed, suddenly the upper edge is too long and one has to be careful to prevent that edge from flopping over. At right you can see what I mean. This might not happen on someone with a bigger bust than me, since the upper edge of the tie would have to travel further to get over the bust. I am going to try to fix this by taking a wedge off the tie extension at the seam where it attaches to the front. The seam is visible in the above photo - it's a vertical line where the stripe pattern is disrupted. I like the top enough that I may make another wearable muslin to test my theory before cutting into the wool jersey. I'll report my findings here when I do that. The only other thing to change is that the sleeves are a slightly awkward length - they hit *right* at my elbow - and they are a little too snug which will be a problem in a less stretchy knit. To wrap up (get it?) this already long post, here are some more pictures. The stripe directions are pretty amusing, I think! * The Sewing Lawyer adores Jalie patterns, which are independently created by a Quebec company. Jalie isn't new. It has been around for decades and its patterns are thoroughly reliable. The Sewing Lawyer doesn't wear a lot of green. At least the greens that tend to get worn around here are more at the blue end. But I'll be wearing it a bit more this summer, recently having created a pair of cropped jeans (Jalie 2908) in a busy green print. It is a glorious day and I decided to take my auto-photo outside in the very green of our back yard. Pardon me for squinting. From that distance you can't sufficiently admire the print on the very stretchy stuff (lurking deep in stash) I used for these. Here's a closer view, with my shirt (RTW lime green embroidered and beaded linen, if you please) tucked in so you can see ... well, not much more. All right then, here's some extreme close up photos. A view of the front is at right, showing the quilting cotton print I used inside the fly, pockets and waistband. And the back. So you can admire the vanishing pockets. You may call The Sewing Lawyer crazy for cutting these out single layer so the print is mirrored, and matching it at the side seams and pockets. Despite the thin inner waistband, the entire thing was too thick for either my Pfaff or my Featherweight (with buttonhole attachment) to cope with, so I hammered in a snap. Everything, down to the zipper and thread, from stash. Yay for "free" clothes! Massive sewing room reorganization - finally! Piles of miscellaneous stuff - like UFOs, my current "actual" project, my current "future" projects and a whole bunch of "maybe sometime" projects, as well as huge piles of overflow stash. Due to certain non-negotiable features of the room (primarily a corner closet door and the location of electrical outlets, there was only one way to get everything in, and the result was a messy maze. It was embarrassing. Lately, it was dispiriting. I think it was depressing my sewing mojo. The next three pictures date from early 2009. From time to time it was better, but then it was also (if I admit it) periodically much worse. To the right is a view from the hallway door. You can see the closet door in the far left corner. It's really hard to get into the closet because the door opens the wrong way (hinges on left). The ironing board jutted into the room because that was the only place it could go. 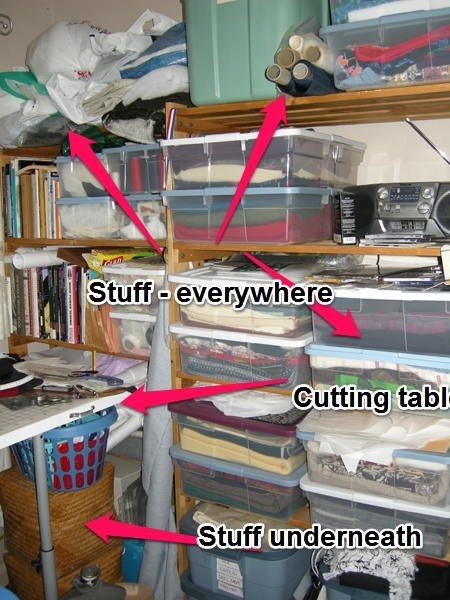 But it was like a big wall blocking off access to the cutting table, closet and window. The beautiful photo at left shows the two shelf units that were located in the right hand corner on the window wall, i.e. opposite the hard-to-access closet from photo number 1. One more? To the right, please meet my sewing table. This was inherited from the original owner of our early 1950s house. He built a lot of items for the house out of 5/8" plywood. The table top has green battleship linoleum on top and it weighs a ton. Perversely, I like it. However, the actual sitting space (between the two ancient file cabinets that hold it up) was limited because the table was jammed between the hallway door on the left and another closet door on the right. That closet stores all my pressing equipment, and also contains the only electrical outlet I can use for my iron and ironing board without blowing a fuse. Several years later, and my son (who occupied the middle sized bedroom) grew up, went off to university, and eventually moved away. It finally felt right to expand into the unused space, and besides, we just took him the biggest piece of furniture - a double bed. The view from the hallway door. With the cutting table gone, I could put the corner desk in the opposite corner, which allows the ironing board to be placed along the wall. This is not only a better use of the space, it'll be easier to use my gravity feed iron in this setup, since the hose comes from approximately the middle of the board instead of the very end. I have a tray set up on top of the little Ikea drawer unit since I need somewhere to pile up my in-progress project. I put the two shelf units on the hallway wall, where the sewing table used to be. They "just" fit. I have to reach in behind to work the light switch. 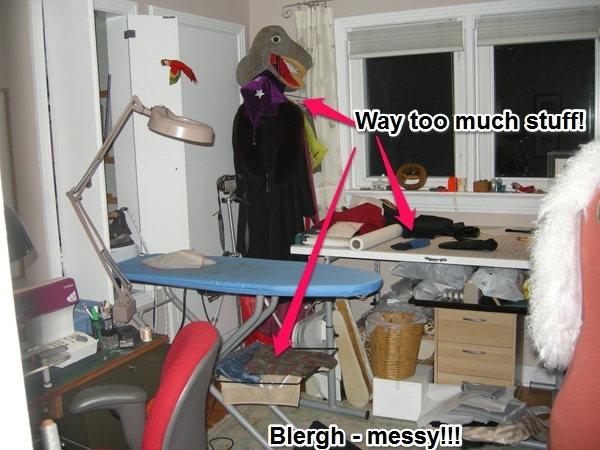 Behold my functional (and temporarily neat) sewing desk! I'm very pleased with this layout and hoping to be very productive in it.